Locate the Emperor's Courier and learn what happened to the letter. Talk to Mynisera at Castle Daggerfall after completing Cyndassa's quest. (Optional) Speak to Queen Aubk-i about the letter. Find the Knights of the Dragon agent to get the name and the whereabouts of the emperor's courier. Meet the courier to talk about the letter. "Hello (player's name). I have heard much about you. Now you come to me with a very interesting tale of deception. So Cyndassa the maid says that Aubk-i opened a letter from the emperor addressed to me. I can tell you (player's first name), that she never delivered such a letter to me. I would like you to investigate this further, (player's name). It could be dangerous to poke into the affairs of Aubk-i without enraging King Gothryd, even though he is my own son. Are you willing?" "Good. I have long had my suspicions about Aubk-i's loyalty to the emperor. She is a daughter of the late King Cameron [sic], who ruled Hammerfell from his citidel [sic] in Sentinel. My husband King Lysandus, (random god) rest his soul, died at Cryngaine, as did King Cameron. Lysandus [sic] body was not recovered, so he has a monument erected there rather than a true tomb. Ah...my mind wanders. 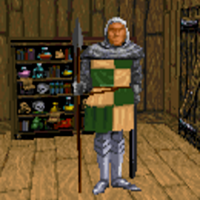 The emperor uses (courier's name) as his messenger in Daggerfall. (He/She) could be anywhere in the region delivering missives. However, (courier's name) is a member of the Knights of the Dragon. Go to (knight's building) in (knight's town) and ask for (knight's name). (He/She) may know where to find (courier's name). Try to find out why a letter addressed to me was delivered to Aubk-i." Mynisera will give you a signet ring to identify yourself to your contacts as one of her agents. "The letter from the Emperor? Actually (player's name) this is rather embarrassing. The letter was stolen from me the same day I received it. I never did read it. I have been hoping that the letter would turn up, or the [sic] the Emperor would send another letter. If you find the letter, I would be most grateful if you would let me personally deliver it to Mynisera." 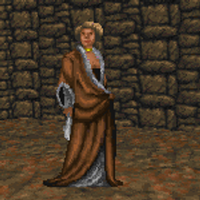 Questioning the Queen will severely lower your reputation with her and Daggerfall. She will also send nightblades after you periodically to prevent you from snooping any further. As a result, it is recommended that you avoid speaking to her until the quest is complete. "I am (knight's name). I would not normally tell anyone who is not a Knight of the Dragon where to find (courier's name). However, I am loyal to Queen Mynisera. I also know that (courier's name) disemboweled the last person that tried to ambush (him/her). In (time limit) days (he/she) is due to be at (palace) in (palace town). Try (him/her) there." "Ho! You should be warned that I am a Knight of the Dragon in the service of the Emperor himself. If this is some ruse to ambush me, you will surely not live to regret it. Hmmm. Yes, I am (courier's name). This signet ring proves that you are indeed in the service of Mynisera. Some time ago I delivered a letter from the Emperor addressed to the Queen of Daggerfall. If I am not mistaken, Aubk-i is Queen of Daggerfall, not Mynisera. Tell Mynisera that I take my duties quite seriously. I would never knowingly deliver a missive to the wrong party. Queen Aubk-i gave me this (jewelry) in gratitude. Show it to Mynisera so that she may know I am a loyal servant and faithful to my Order." "Ah! Now it makes sense. Uriel Septim addressed the message to the Queen of Daggerfall. When he sent it, I was queen. By the time it arrived, my dear Lysandus was dead and Aubk-i was queen. We must find out what was in that letter. I have never trusted Aubk-i. Yesterday I received a letter from Princess Morgiah of Wayrest claiming to know something of the emperor's letter. Now there is a family that seethes under the rule of the Emperor. Return to me if you find out who has the emperor's letter. For now, you have proven yourself to me (player's name). Keep the (jewelry) as a token of my gratitude. I have no desire to own anything of Aubk-i's anymore." If you report back to Mynisera after you have met the courier, you will gain reputation according to the table below. If you question Queen Aubk-i about the emperor's letter, you will lose reputation according to the table below. Be careful when opening the door to Mynisera's room, as straying from the main chamber will cause the guards to attack you until you leave. "Aubk-i must have you tightly wound around her finger, (player's name). I hope you survive to benefit from her patronage." The knight's dialogue remains the same even if you are a member of the Knights of the Dragon. "A signet ring emblazoned with the Daggerfall crest and Lysandus' personal crest." 0 (Date): Mynisera, Queen Mother to Gothryd, has asked me to investigate why a letter from the emperor addressed to her ended up in the hands of Queen Aubk-i. The emperor's messenger, (courier's name), can only be reached through (knight's name) of (knight's town). Both are members of the Knights of the Dragon. She has given me a signet ring to prove my trustworthiness to them. 1 (Date): Mynisera's signet ring bought the trust of (knight's name). (He/She) told me that (courier's name) would be in (palace town) at (palace) in (time limit) days time.